When you reach that point on the weekend, where you realise you’re hungry, but time has slipped away, with most venues closed until dinner. It can hard go find a place still serving. Keep Mango Hill Tarvern in mind if you happen to be on Brisbane’s Northside. Serving throughout the afternoon, with plenty of room, a variety of table settings, and extensive menu, they might just be the dining option you are seeking. 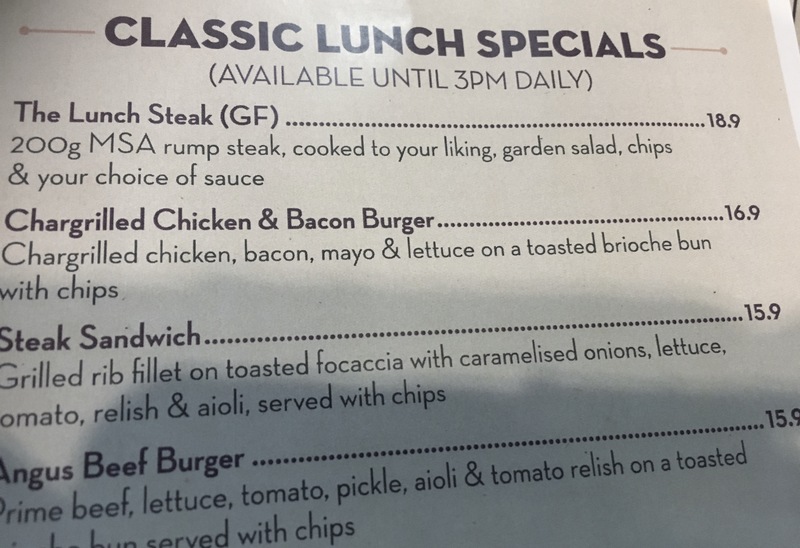 Today I chose from the classic lunch menu, opting for the Lunch Steak. Sometimes you just feel the need for a simple steak meal. 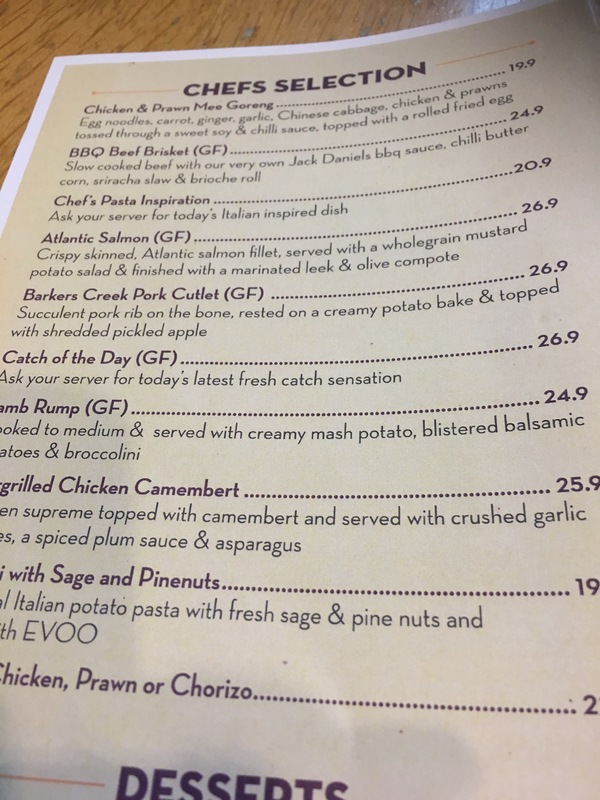 Select your meals, take note of your table number, then order via the friendly staff at the counter. Sit back and await the delivery of your meal. 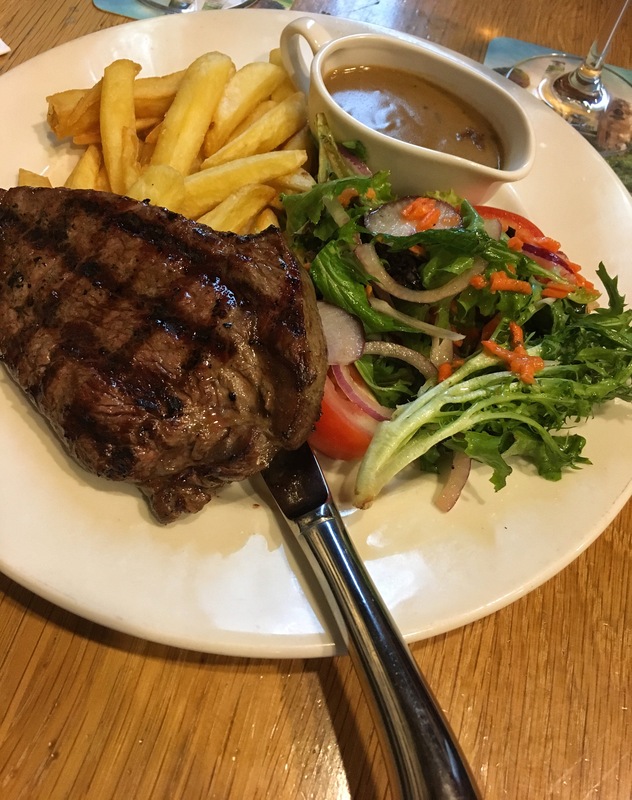 Overall, enjoyable, steak was cooked as requested which is always a bonus. 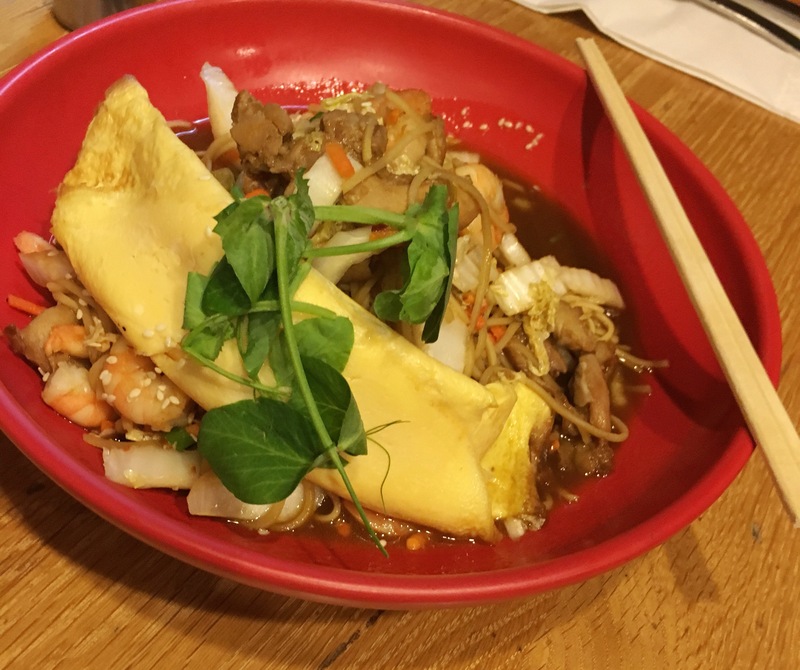 Branching out a little from the usual, Hubby chose the Chicken & Prawn Mee Goreng. Spiced with ginger, garlic, chilli & soy sauce, he enjoyed every morsel. 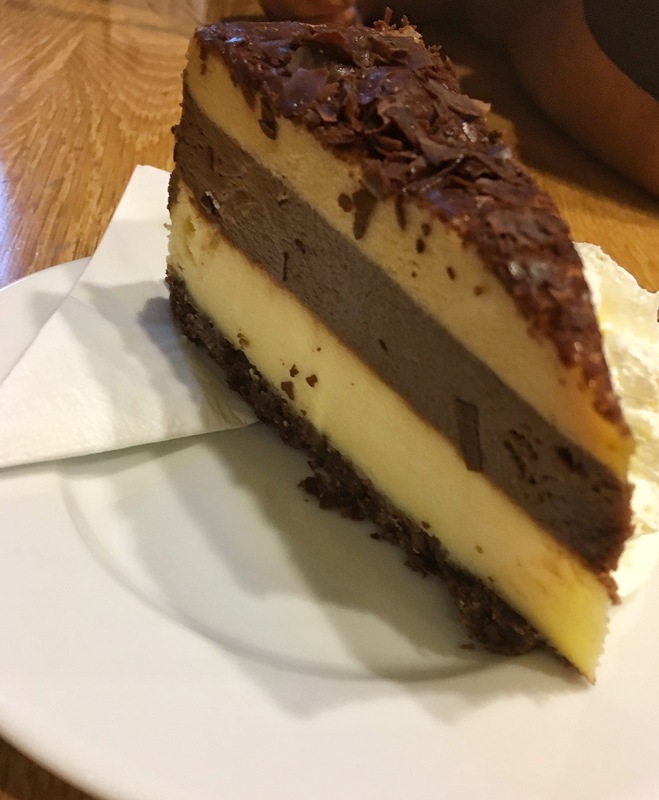 Finishing with a sweet, Hubby enjoyed the moral sin cheesecake. Stop by for a visit if you are in the area, there’s something on the menu for everyone. Enjoy! What better way to spend a fabulous Queensland Sunday morning, than with a drive to the Wynum/Manly area. 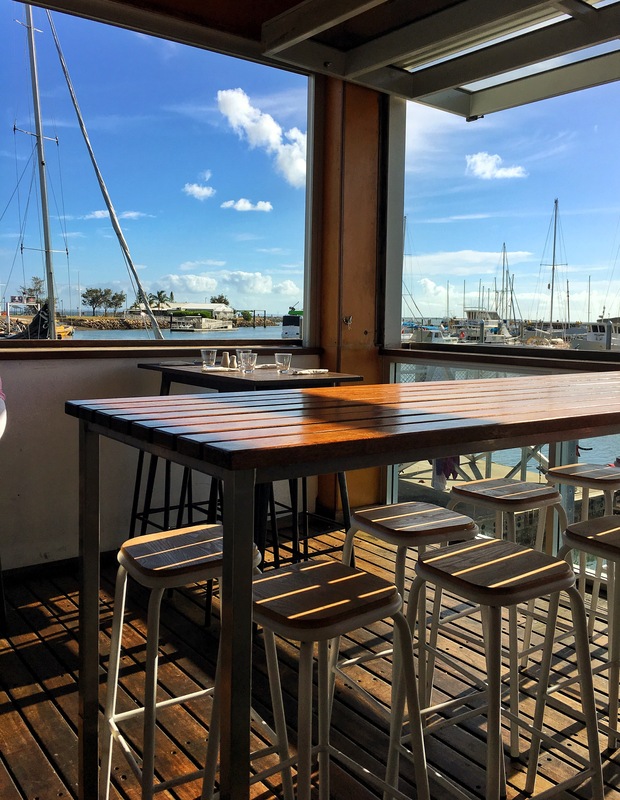 As the temperatures soar around Brisbane, there is nothing nicer than a cooling sea breeze. 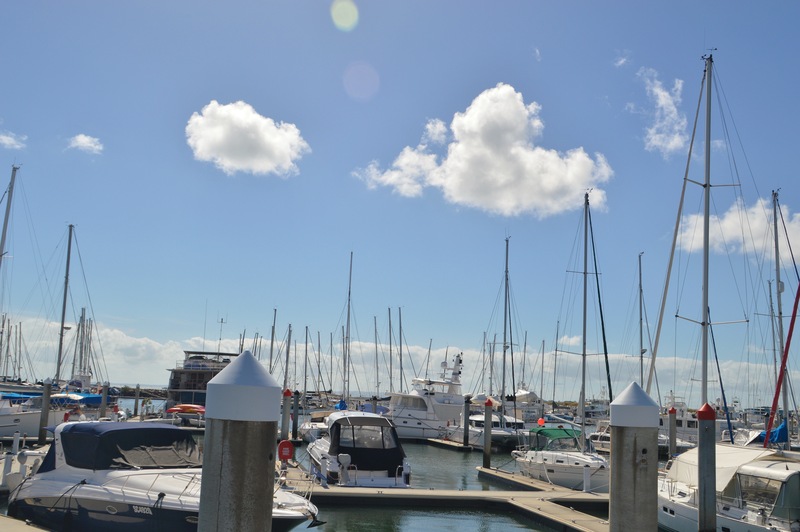 Fluffy clouds framed the marina, whilst a multitude of yacht masts pierced the blue skies. Reflections, beautiful vistas and a general feeling of calm, were wall great ingredients towards a relaxing breakfast. Recently reopened under new ownership, they had a busy morning on their hands. Staff though were pleasant throughout delivering food and drinks to the table once you had placed and paid for your order at the bar. 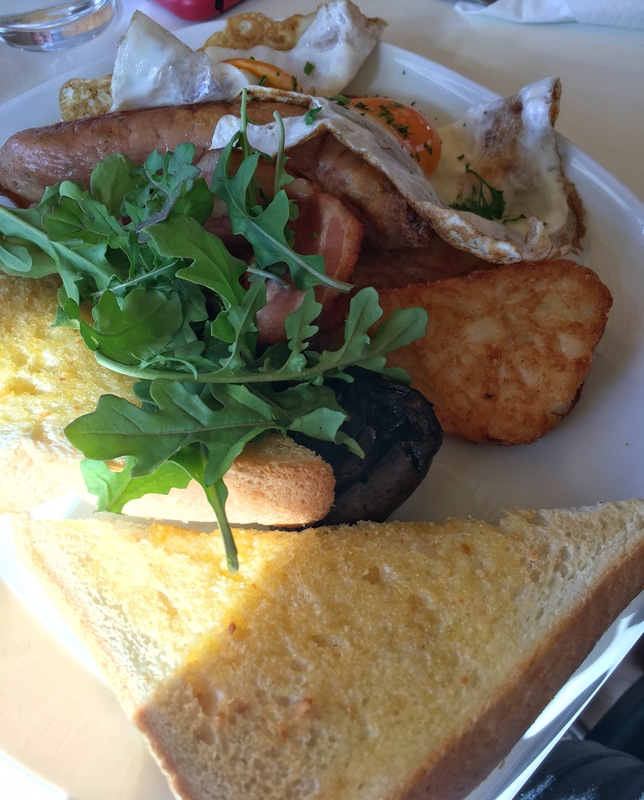 The wine list looked enticing, but this was brekky, so give it a miss and lets check out the brekky menu. A nice variety to choose from, with extras at reasonable prices to add on. My choice today was the Avocado on Sourdough, with the addition of mushrooms, tomato and haloumi. Not only an impressive looking meal, but the taste was superb. 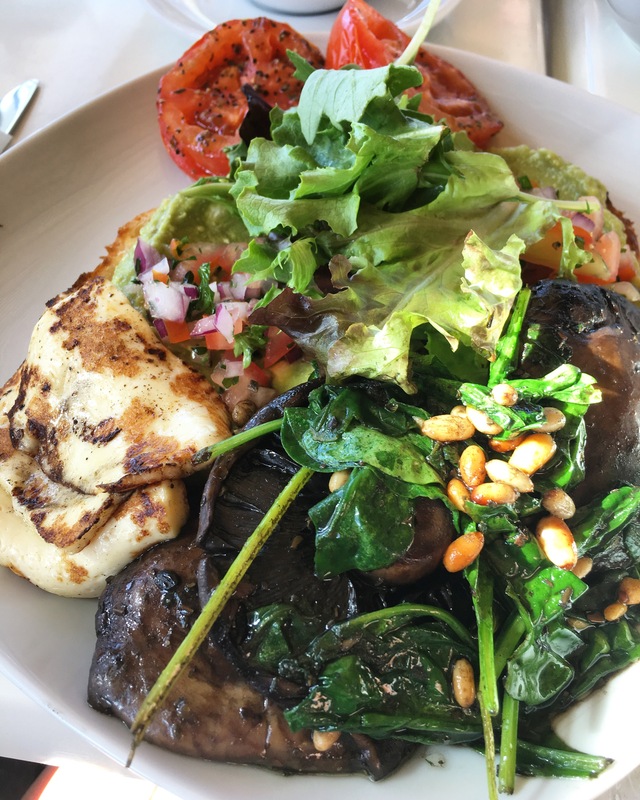 Big juicy field mushrooms paired with the softest grilled haloumi I think I have ever enjoyed. Mixing this with the smashed avocado on sourdough was a devine breakfast. I must mention the tea. WIth a very limited choice on the menu, my intention was green tea, until I spotted the Selection of teas behind the bar. Ah, now we are happy! For the non-coffee drinkers out there, check the tins behind the bar, they do have a nice tea selection. 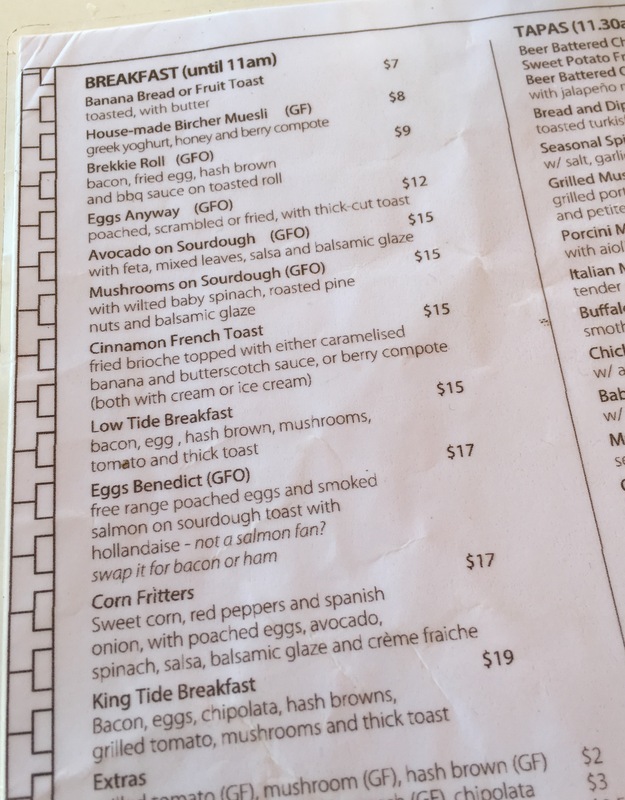 Hubbys choice today was the King tide breakfast. As the meal was devoured, you could tell it was enjoyed. The only comment being, it could have been a little hotter. However though freshness, taste and presentation made up for this on what was obviously a very busy morning. Plenty of seating throughout, and to be honest, this area looked very inviting for one of those lingering launches. The sun in the morning was intense in areas, until it lifted over the roof. That was only due to the ongoing queensland heat though. 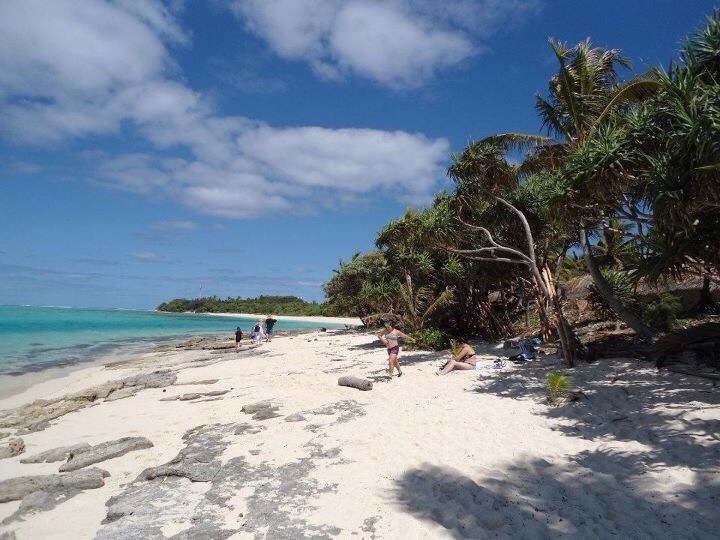 Breath’s of sea breeze wafted through the area irregularly, giving patrons a lovely cooling break from the heat. 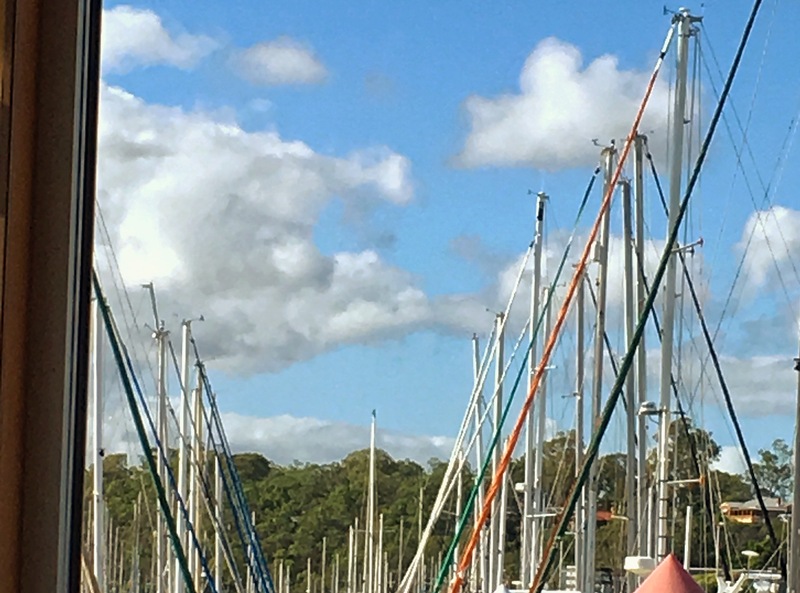 What can be more calming than sea breezes and a myriad of masts. With a beautiful location the potential for this businesses expansion must be high. 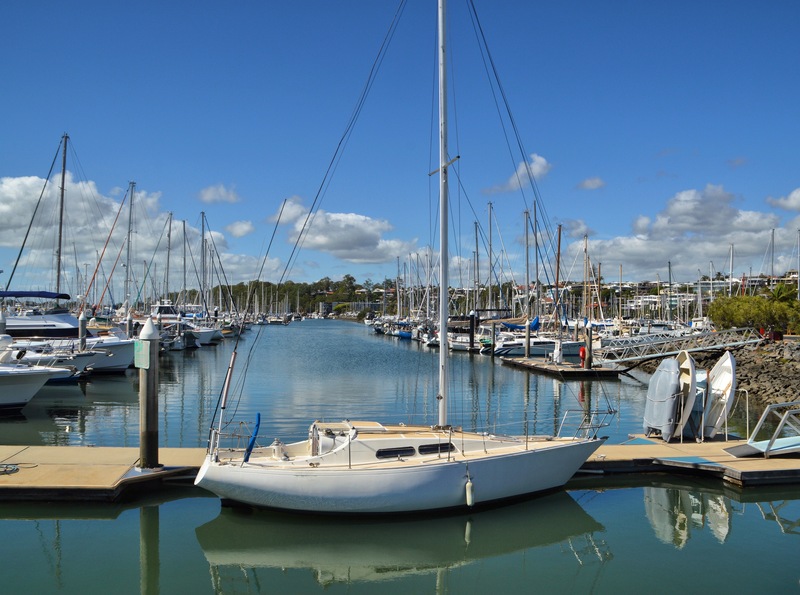 Take the time to drive through the area, stop at the marina, check out the Sunday markets and relax. Visit the Tide Wine bar, I have a feeling you’re going to like it.